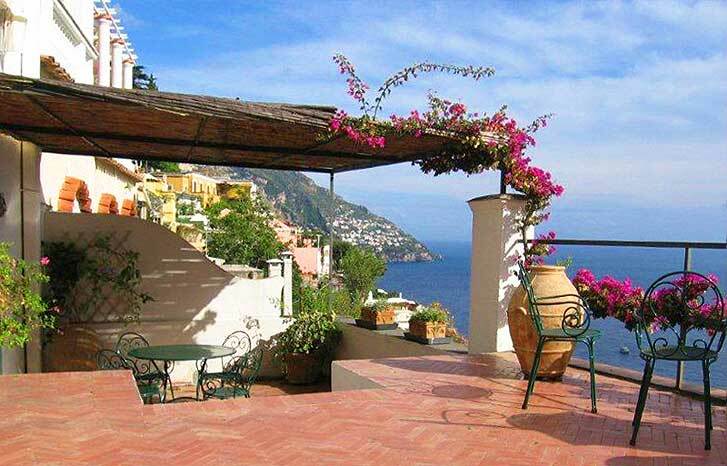 Villa Positano is an impressive Villa with a wonderful view on the blue sea and on the historic town center of Positano. 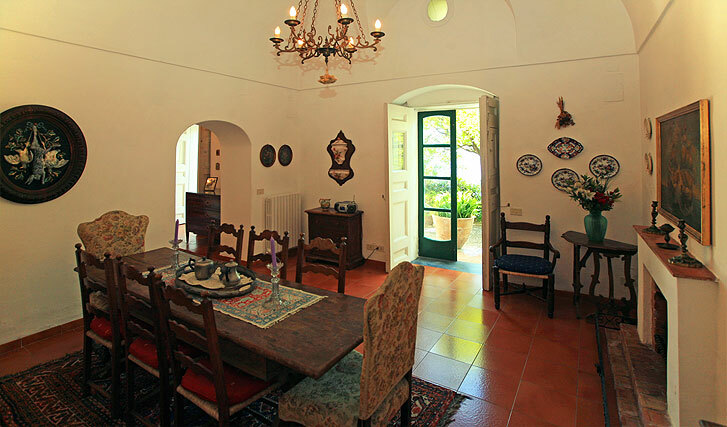 This dominating Villa, from the 16th Century, consists of high and luminous rooms, many terraces overlooking the blue sea and large spaces inside the property. 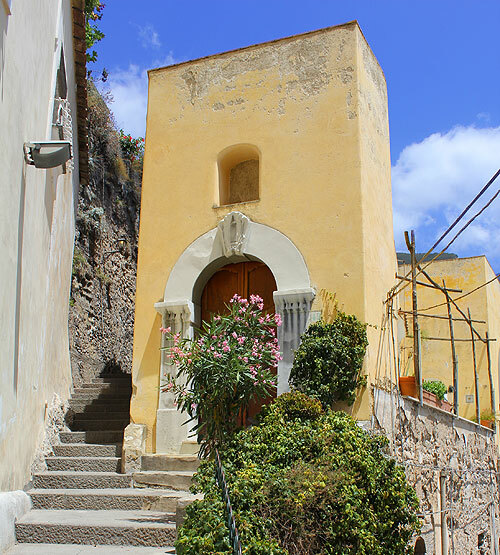 All the houses in Positano are built on a steep hill. One house is right next to the other and it looks like each roof terrace is just above the lower unit. It’s like a huge staircase of houses moving up the hill. Before the 40’s there was no street to reach the town with the car, the only way to reach the fishing village of Positano was by the sea. The town was built up on a rocky cliff. It is a natural Bay with sandy beaches and the town constructed right behind the beaches. 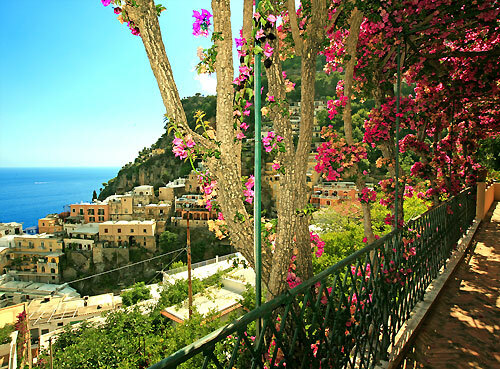 Positano in the past centuries was unreachable from the mountain side, it was a medieval Pirates’ town. 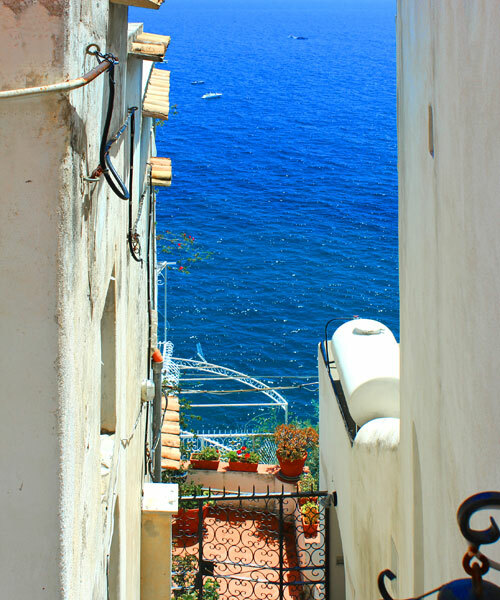 Today Positano is a picturesque place with many small streets and stairs. You won’t need a car here. From the Villa you will reach the beach in less than 10 minutes walk. Supermarkets and delicious typical restaurant are in 3-5 minutes walking distance. 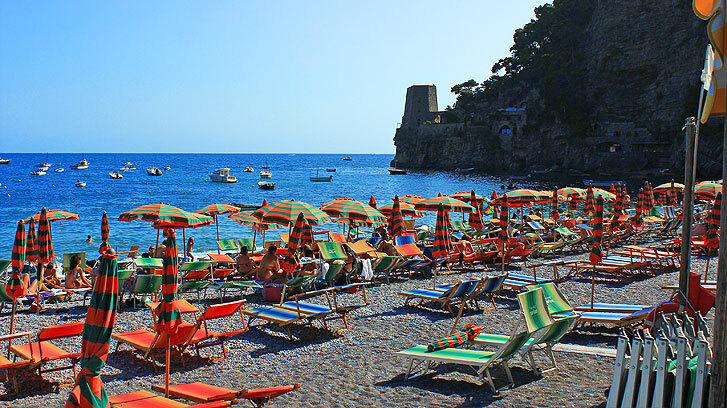 In Positano you can practice all kind of water sports: diving, sailing and surfing. There is also a windsurf school offering courses. You can rent a Zodiac dinghy and discover the coast line up and down, there are many hidden bays that you can reach by boat only, perfect for swimming, snorkeling and fishing. Every hour there is a ferryboat (Traghetto) to Capri, Amalfi, Sorrento and Napoli. 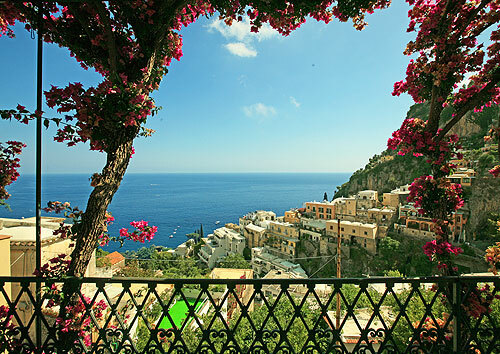 Each place is an amazing daytrip, especially Capri and Sorrento. From the entrance you will find a staircase up to the villa. On the groud floor there are 2 living rooms each with fireplace and space to chill together, there is a dining room and a big kitchen with dining area. 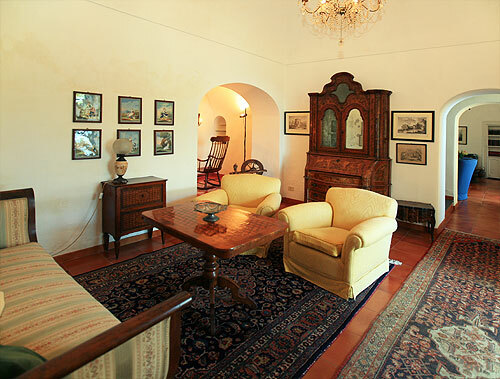 The owner has decorated this rooms with antiques furniture and many paintings. 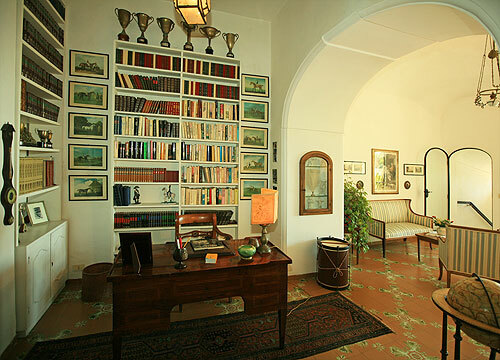 The rooms on the ground floor are connected by arches so that you have a continuous space of more than 15 meters. 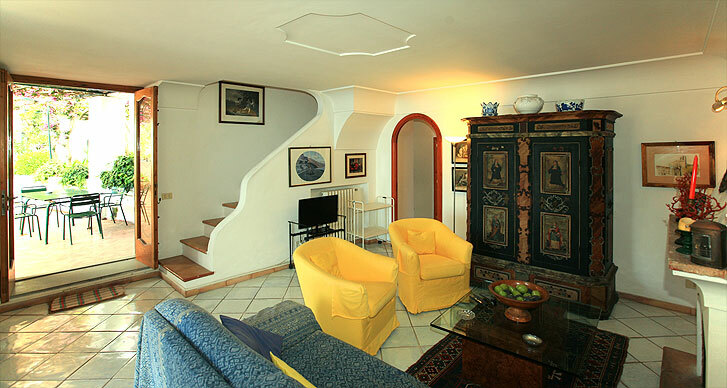 In Villa Positano you will find always a pleasant temperature, as the rooms have 4 meters high ceilings and the property has massive natural stone walls. 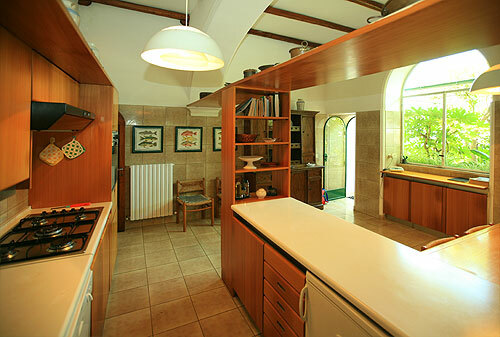 Each room on the ground floor has direct access into the garden. 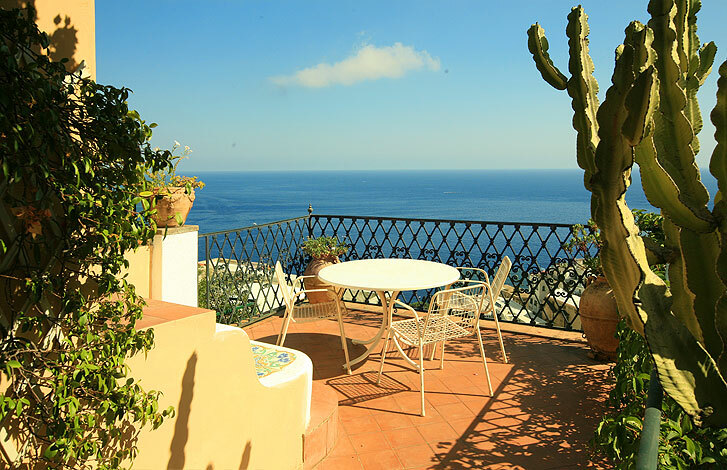 In front of the villa there is a huge terrace with an amazing view on the sea. 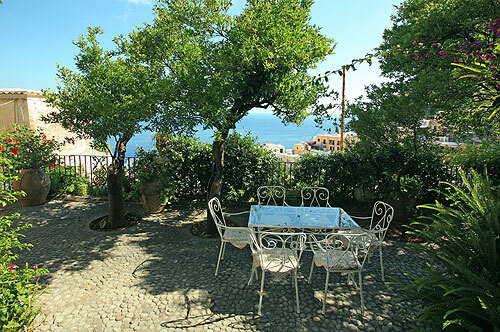 The terrace is decorated with many scented Lemon trees and comfortable shadow areas. The big kitchen is well furnished. It has dishwasher, washing machine, 2 fridges, 5 burner stove, oven, coffee machine, toaster and all the pots and pans you will need. There is a dining area with tables and chairs but once you are there, you will probably have dinner always outside on the terrace. Between the two living rooms there is a black granite staircase which leads up to the first floor with its 3 bedrooms. All the bedrooms are furnished with individual air conditioning and have a French door that leads on the balcony terrace. The bedrooms are large each about 35 sq. meters. They are decorated with antique furniture. Upon request it is possible to have 1 or 2 extra bed. 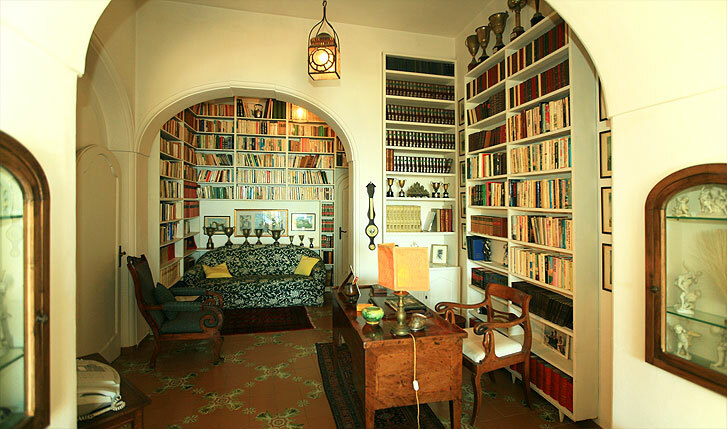 The owner is a famous antiques collector from Arezzo, that’s why he has personally decorated with love and passions the Villa Positano, which was the place where he grew up. 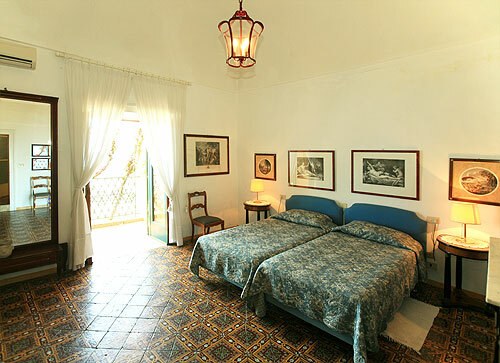 The floors are made with original Sicilian’s tiles and the Villa still has its original vaulted ceilings. 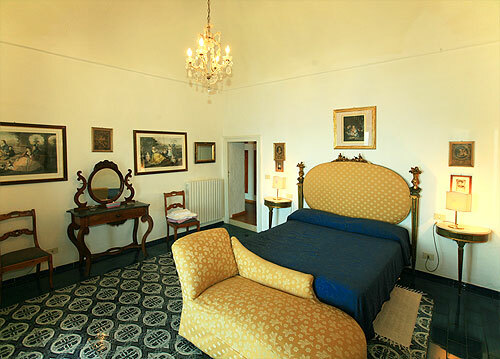 All the rooms are painted in white and have big glass doors which lets the sunshine in. 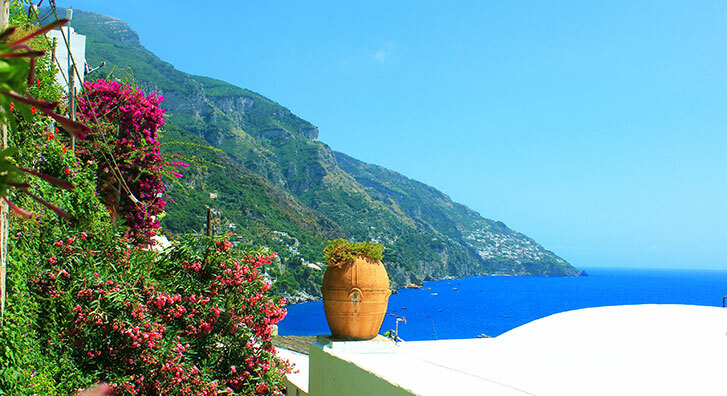 From the bedrooms you can take a step outside on the balcony with and overwellming viewful view over the blue sea, the town of Positano and the clear sky. The balcony features a secular Bougainville plant, covering it completely with red-purple flowers. A real spectacle. 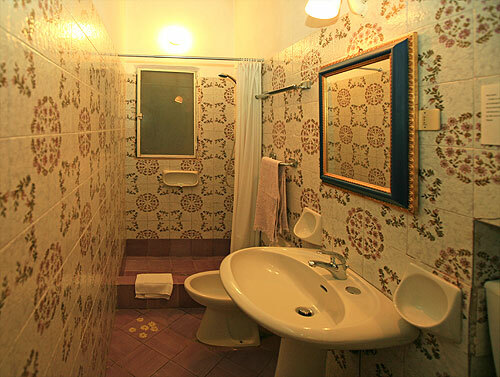 The 3 bathroom are furnished with shower box, WC, bidet and washbasin. On the first floor there is another living room with Sky and SAT-TV, a writing table and a dining table. Everything is decorated with beautiful antique furniture. There is fast WI-FI Internet connection, a phone line and Fax. You have direct access on a terrace with a small table and chairs and a tremandous 360 degrees panorama. On the big ground floor terrace there are 2 sitting areas furnished with table and chairs. From the kitchen there is a direct access to the breakfast terrace, to eat here is a real privilege. Imagine yourself on a summer day while enjoying your meal with this amazing view from the small historic houses down until the beach, so perfect that seems unreal. 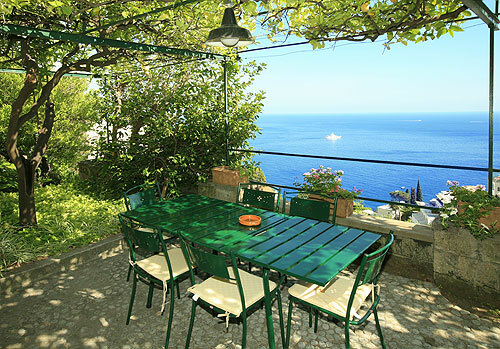 Villa Positano-B is a freestanding villa with private and independent entrance. Here there are 2 bedrooms and 2 bathrooms. 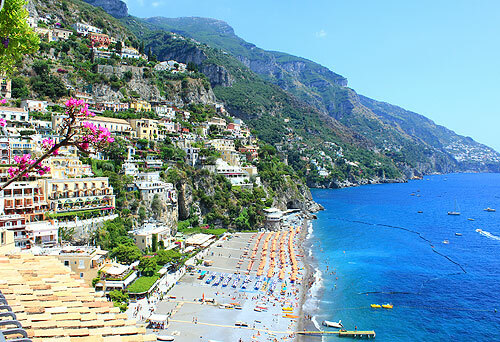 The next 9 pictures show Positano-B. 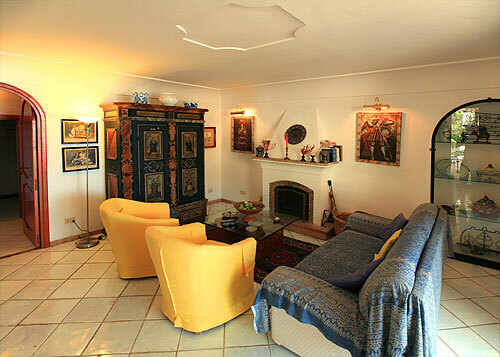 This property can be rented separately or together with the main villa Positano-A. 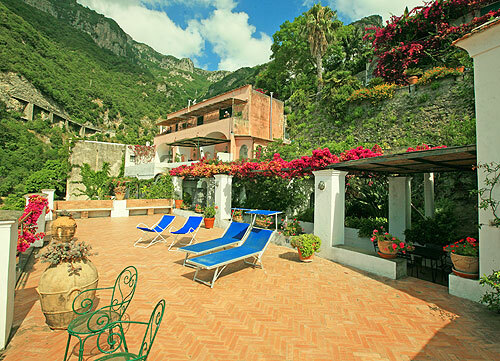 Positano-B has a small private garden decorated with exotic plants. 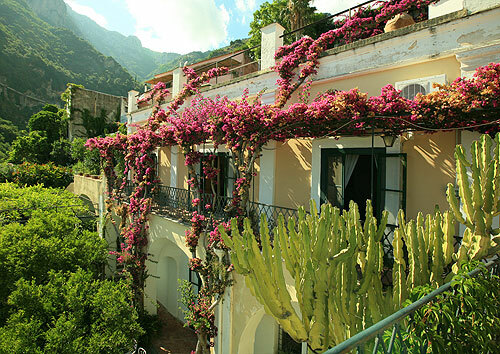 There is a 40 square meters Loggia decorated with Lemon trees and Bougainville. A perfect place to chill in the shadow. 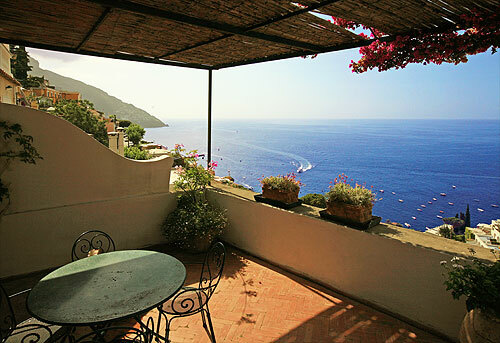 In front of the Loggia there is a large open terrace, about 90 square meters, with a fantastic breath taking view. Here there are lounge chairs where you can seat and enjoy the panorama. Three steps down there is a rain-proof covered loggia with entrance to the living room. There is a dining table and chairs as well as a fantastic view. It doesn’t matter if it’s sunny or rainy, you always will have a wonderful outside place to eat or rest. The living room has a fireplace and a sitting area. Everything here is decorated with beautiful furniture. Particular is the ornate cabinet from the 18 Century. There is a fast Internet connection (Wi-Fi), a phone with land line and fax machine as well as Sky and satellite TV. From the living room you will reach the kitchen. 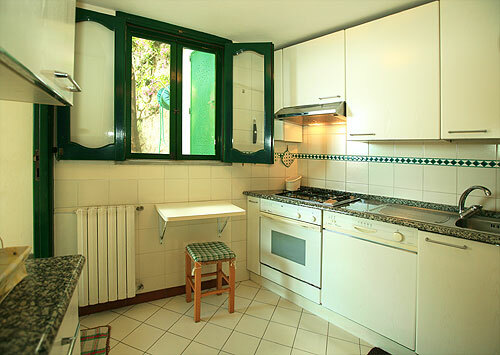 Is a small cozy kitchen furnished with all necessaries: dishwasher, washing machine, coffee machine, fridge, 5 burner stove with oven, toaster and all the pots and pans you will need. In the living room you will find a staircase that leads up to the first floor. There is a bedroom with a double bed and a bedroom with twin beds. 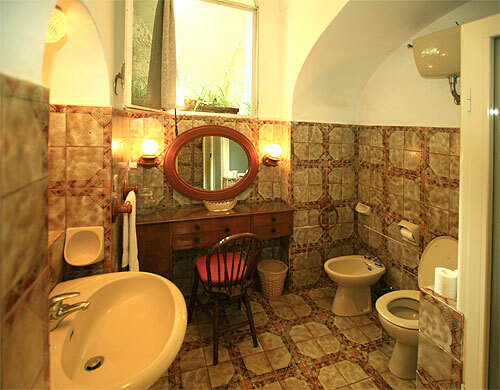 Each room has individual air condition. 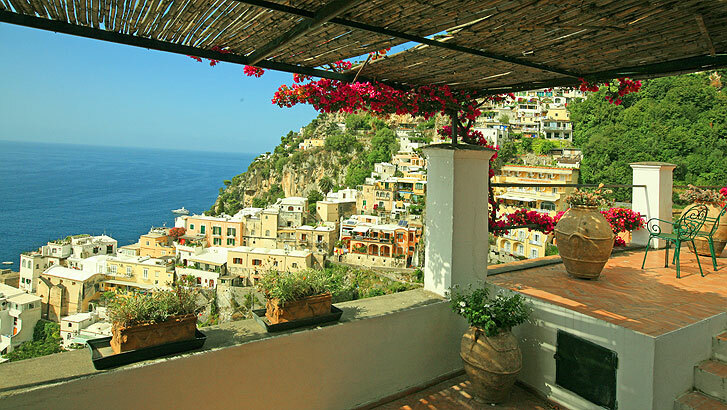 Comparing this villa to Positano-A, this one is more modern, almost businesslike, but bright and cheerful. 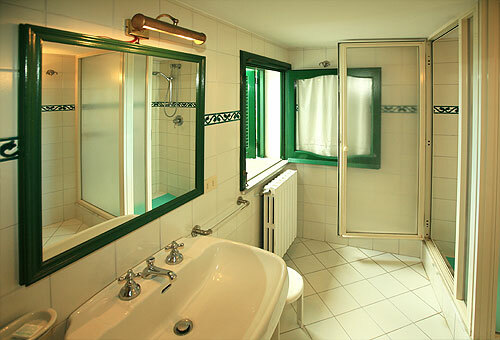 The bedrooms and bathrooms are all new and modern. 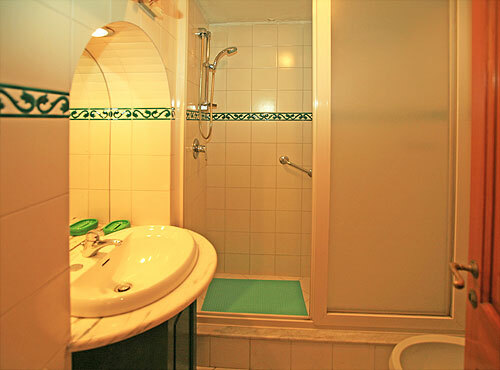 The 2 bathrooms have shower, WC, bidet and washbasin. 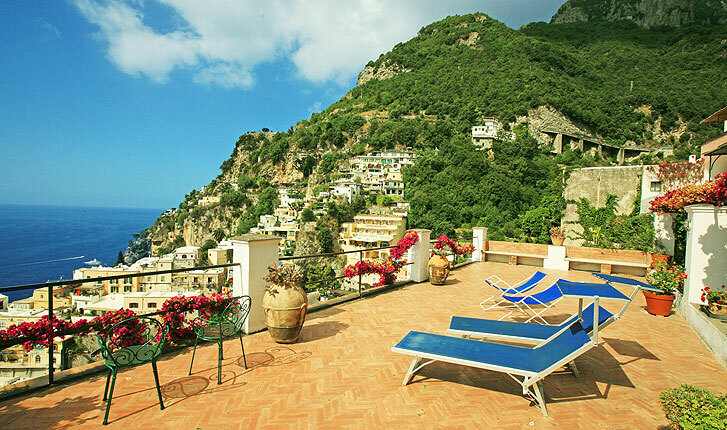 Villa Positano is a freestanding villa with private and independent entrance. Here there are 2 bedrooms and 2 bathrooms. There is a small private garden decorated with exotic plants. 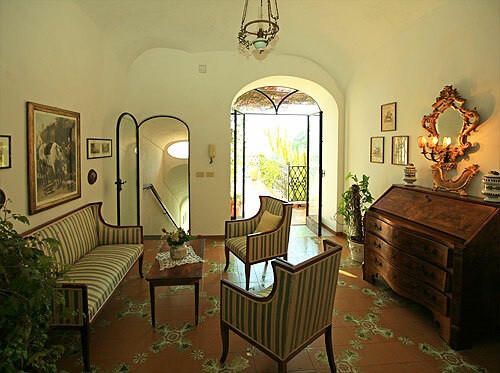 There is a 40 square meters Loggia decorated with Lemon trees and Bougainville. A perfect place to chill in the shadow. In front of the Loggia there is a large open terrace, about 90 square meters, with a fantastic breath taking view. Here there are lounge chairs where you can seat and enjoy the panorama. In the living room you will find a staircase that leads up to the first floor. 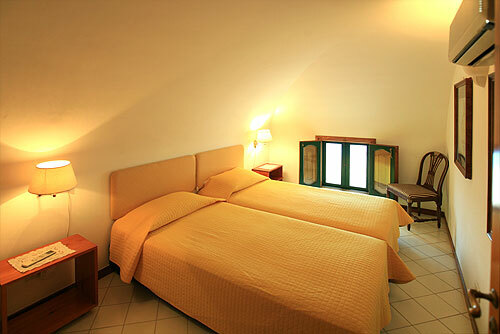 There is a bedroom with a double bed and a bedroom with twin beds. 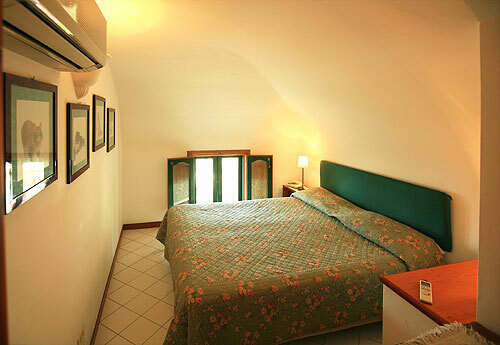 Each room has individual air condition. Beautiful house with very large rooms so group members can spread out. Great decks, amazing views, responsive host. 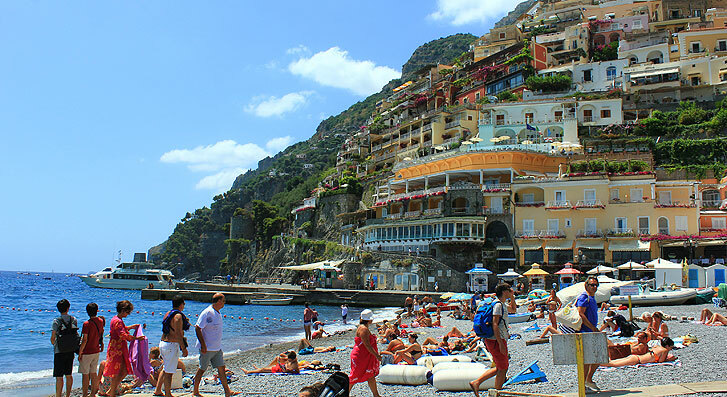 This was our first time in Positano, and truthfully a talk with Thomas convinced us to go. We went hoping for the best and were simply blown away upon arrival. We decided to give up the car we had used during the first part of our vacation in Tuscany. It was a wise decision. We arranged to be picked up in Naples and driven to the house. The only thing that I would suggest is that the house sign outside on the street is labeled differently so our driver got a little thrown but we found it pretty easily. The Villa is amazing and the views from almost every single room are stunning. 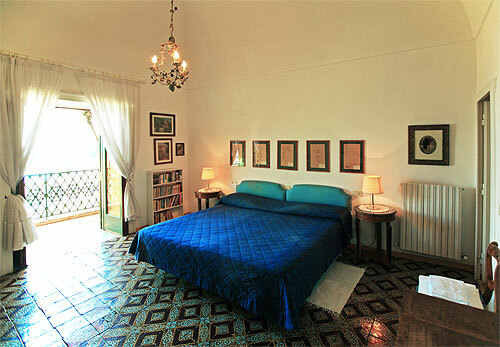 Each bedroom opens onto a balcony with glorious purple flowers and vines overhead. 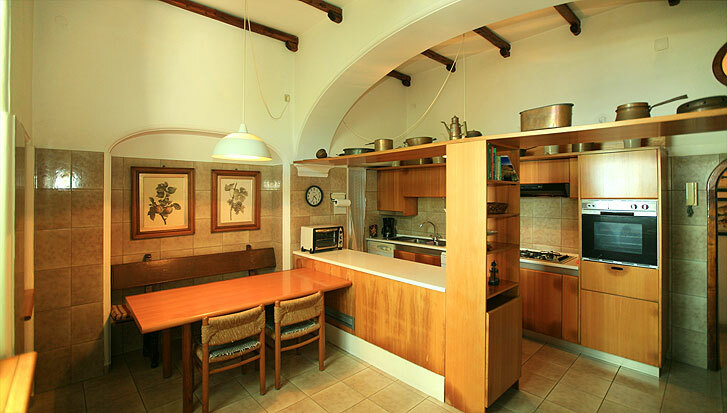 The kitchen is perfect and opens onto another balcony where you will sit and have your morning coffee. The bedrooms are all grand with 20 foot ceilings. This magnificent Villa is beautifully furnished and yet feels so much like a warm and inviting home. There are two other outdoor seating areas that are spectacular. Oh, did I mention the lemons growing right over your head on the kitchen balcony. This is a one of a kind property that is not to be missed. The beach below the house in may wind up being the only destination you might want, with Pulpettos serving drinks and food. Da Vincenzo, Next 2, and Chez Black were some of our favorite meals. The black squid ink pasta at Chez Black might be one of the best plates of pasta I have ever eaten. We took a cruise to Capri for a day that leaves right from the main beach in town. We also took a day trip to Pompeii which was one of the most powerful sites I have ever visited. I actually went back alone for a second trip, while the rest of my crew stayed at the beach. It is a must see. I will say that no matter how tempting it is to visit the restaurants, and eat some of the best seafood you will ever have, you must stay in and have dinner on the terrace off the kitchen at least one night. It is magical. There is a small store right down the street with everything you need.The bus stops right near the house, if you need. 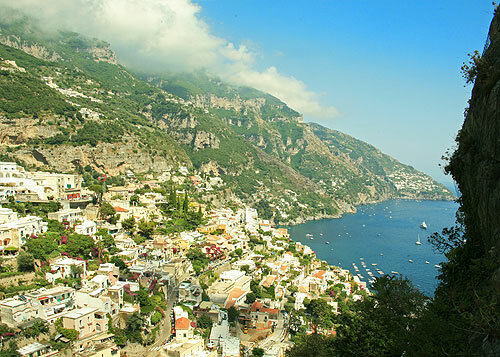 we honestly did not make it to Ravello or Amalfi on this trip. The Villa was so special it made it more of a chill and relax trip for us than we had planned. It is that special a place. My wife has already decided her next big birthday will be celebrated here. We had an absolutely magical time here. We are now sadly back several weeks but I can see the view and feel the house in my mind every day. We will be back again soon.